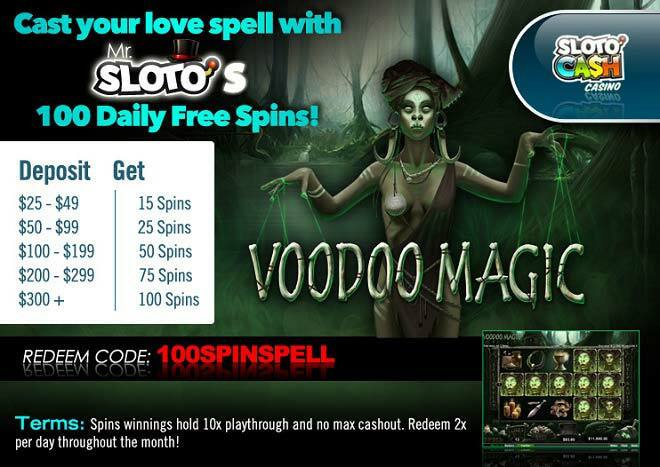 Cast your love spell with Mr. Sloto's 100 Daily Free Spins! February is the perfect month to fall in love - and you'll be quickly falling in love with Mr. Sloto's charms when you deposit as little as $25 to play with up to 100 Free Spins! Use black magic to your advantage this month of love when you spin the reels of the mysterious Voodoo Magic slot! Play with the Magic Multiplier, which is triggered during the free, spins feature and will grant you prizes that are 1x in the first free spin, 2x in the second free spin and continue going upward during each spin! Feel Mr. Sloto's love when a winning spell is cast in your account the moment you deposit as little as $25!